Quench lowers maintenance costs with a rugged, low-cost design. During repair, the system can be converted to manual operation, allowing for continued water access. Installing and maintaining Quench is simple and flexible. 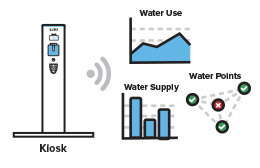 The kiosk unit can replace any existing water system, whether grid power exists or not. In addition, Quench is built with modularity in mind, so parts can easily be replaced when maintenance is needed. 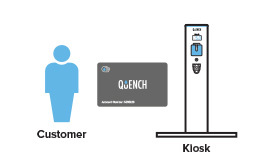 Quench enables accurate daily water metering, storing allotments in a tamper-proof smart card system. This allows operators to allocate daily lifeline water amounts to families and ensure equitable distribution of water based on seasonal availability. 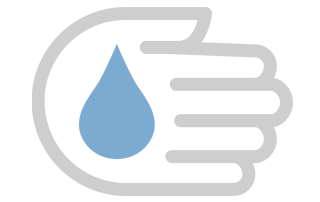 • Quench provides more reliable, 24/7 service, while the costs of staffing and financial management of the water dispensing operation are reduced. 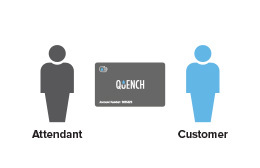 • Quench allows local operators to design a payment model that fits their customers’ needs, including pay-as-you-go, pre/post paid usage or free/subsidized service. • Water usage is easy to track and very transparent. • Ensures allotment of a lifeline amount of water based on seasonal availability without spending time in a queue or having to store at home. • Quench kiosks are easy to operate and help minimize transaction costs while ensuring clarity. • Quench kiosks are easy to install and maintain, and feature a rugged, anti-tamper and weatherproof design. Components can be easily removed and replaced and the kiosk can still be operated during maintenance. • The Quench system is designed to be adaptable to many different settings and dispensing options, allowing for it to be implemented in diverse environments. • Quench makes water schemes transparent. The system provides auditable transaction logs, allowing governments and donors to create performance-based contracts with water suppliers, ensuring improved maintenance of water points. • If available, Quench can be connected to cellular or wireless networks to enable real-time metering and system monitoring. The Earth Institute and the School of Engineering at Columbia University are the world’s leading academic centers focused on addressing the challenges of global sustainable development. In addition to mobilizing the sciences, education and public policy to create sustainable programs abroad, EI also provides multi-sector policy advice to governments, the United Nations and NGOs on issues related to sustainable development and the Millennium Development Goals. Professor Vijay Modi is leading the Earth Institute’s efforts that cut across energy, rural infrastructure and development. He led the UN Millennium Project effort on the role of energy and energy services in reaching the Millennium Development Goals. The Modi Research Group at The Earth Institute brings together a diverse set of talents who work in collaboration to engineer solutions to global development challenges. The Modi Group is a team of international development experts, faculty, engineers, designers and data analysts.